The Beehive is a restaurant designed by a family that loves to cook – collectively they have over 100 years of Foodservice experience and being of Greek descent have a very simple philosophy … everyone that walks through our door is treated like family. At the Beehive you should expect great food at a good price served in an unpretentious atmosphere by a family that wrote the book on hospitality.The design of the Beehive embraces both traditional and contemporary sensibilities to create a fusion that one might attribute to an elegant modern country house. The strategy to achieve this look is seeded first in the simplicity of the layout of the space and modernization of the dining experience. The use of moldings, sconces, earthy colors, natural materials and traditional dining chairs complete the look of a warm and welcoming dining experience. One can eat in our more casual “tavern” room lit by Edison bulbs with cozy booths, our L-shaped bar and large rectangular tables or in our more formal “great room” with a tray ceiling, rustic oak floors and honey colored walls. The original Beehive opened in Mount Vernon back in the 1940’s. It was owned and operated by Anne and Peter Modroukas’ Uncle, Louis Tiglias. 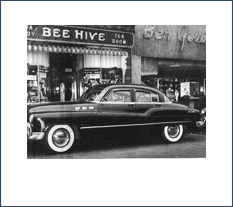 The Beehive became a mainstay on 4th Ave until it was retired in the late 1960’s. 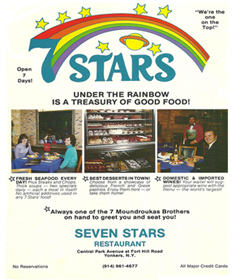 Louis Tiglias later served as the Executive Chef of the Original 7 Stars under Peter Modroukas (current Executive Chef and Owner of the Beehive) during the late 70’s and early 80’s. When the Family began looking for a location for what collectively would be their 7th restaurant they came across this location in Armonk which originally opened in the1920’s as a Swiss Tea Room. Upon purchasing the site in 2004 the Family re-named it the Beehive commemorating Uncle Lou, and hoping to recapture the warm hospitable atmosphere with great food.